The 11-game losing streak is over, and with it, a resurgence. 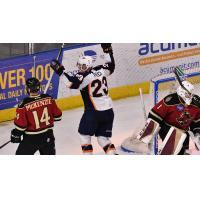 The Greenville Swamp Rabbits picked up wins in three of four games over the past week. In need of a surge for the final 20 games to get to the fourth and final playoff spot, of which they trail by 13 points, step one of the foundation was accomplished by turning their fortunes around, taking leads, and scoring goals, which had been a challenge prior. The Swamp Rabbits took on the hottest team in the ECHL, the Atlanta Gladiators, on Monday night, in need of a win to snap the streak. Greenville jumped out to a 2-0 lead after the first period, but saw the Gladiators find a way to turn the tables and lead 3-2 early in the third period. Jake Bolton's goal tied the game, and newcomer Kamerin Nault continued his hot streak with the game-winning goal at the 2:36 mark of the extra session to snap the streak. The Swamp Rabbits found themselves in a similar position on Friday night in Worcester, which started a three-game swing against the North Division. Luke Ripley scored his second goal in as many games, and Dylan Vander Esch added one more to give Greenville a 2-0 lead through two periods of play. Unforced errors and penalty trouble put the Swamp Rabbits in a bind, and Worcester's normally silent power play rose to the occasion, scoring three times in the third period, and giving the Railers a come-from-behind victory. From there, the Swamp Rabbits' frustration was taken out on opposing goalies. In the first-ever matchup of the Swamp Rabbits and the Maine Mariners, Greenville came out firing. Led by forward Chris Izmirlian, the Swamp Rabbits scored the game's first four goals. Izmirlian potted four goals on the night, and the team notched six goals in the second period alone on 19 shots on goal. Johno May and Will Merchant ended goal droughts in big ways. Maine was forced to use both goaltenders, and neither could stop the bleeding. At the other end, Greenville goaltender Garrett Bartus held the fort with 29 saves on the night, and a key win for the good guys. The good feelings transferred into Sunday afternoon's tussle with the Manchester Monarchs, though it did not look like it would be that way early. Manchester and Greenville combined for five first period goals, and the Monarchs held a 3-2 lead after the first. Once again, led by Izmirlian's incredible week, and four points, the Swamp Rabbits scored the game's final five goals, including a pair from both Austen Brassard and Nault, en route to the 7-3 win. Riding a high, the Swamp Rabbits will have a relatively light schedule over the next week, until it ramps into overdrive to end February and begin March. No one in the ECHL was as prolific as Chris Izmirlian over the past week. He scored four goals, including the game winner over the Maine Mariners on Saturday night, and on Sunday afternoon, picked up right where he left off with a goal and three helpers. All of this offensive productivity came after missing a month with an upper-body injury, and in need of zero time to reacclimate to the system or the pace of play. He was also a stalwart defensively, finishing the week as a +6. The road was a sore spot for the Swamp Rabbits to begin the year. It took until November 10 to get their first road win of the year. Now the Swamp Rabbits have more road wins (9) than home wins (8) on the year. Kamerin Nault's Swamp Rabbits career is one worth investigating at the end of the season. Nault has points in six of the nine games that he has played in, and has three multi-point efforts already. Nault had five points in nine games as a member of the University of Manitoba prior. The Swamp Rabbits added forward Brian Morgan off of the waiver wire from the Florida Everblades on Saturday afternoon. Morgan is playing with his fourth team this season, and has 21 points in 56 games prior. He scored two goals against the Swamp Rabbits this season- the only two goals he has on the year. Scoring the first goal has been crucial to success. The Swamp Rabbits have a .619 points percentage when getting the game's first goal (11-6-4). Friday, February 15 | @ Atlanta Gladiators | 7:35 p.m.
Sunday, February 17 | vs. Newfoundland Growlers | 3:00 p.m.